A window fan is a product that you place inside the window of your home. Instead of leaving the window open and hoping it creates a breeze, you can have an electric fan that helps to maintain a comfortable temperature in your home. It’s more affordable than air conditioning and is effortless to install for most people. Every window fan on the market differs, so it’s your job to hunt through the options and determine your needs and what each manufacturer has to offer. It pays to be quick, too, for the warmer weather is right around the corner – and you want to be ready when it arrives. Even though you can’t control this window fan with a remote, you will appreciate several other features it has to offer. You can soon replace those feelings of disappointment with elation. The first thing to impress will be the installation process. Even though it can be a tight fit, it’s not all that challenging to install. Once it’s in, you can immediately enjoy all this window fan has to offer. It has three speed settings, Max Cool technology, and operates within the range of 60 to 80 degrees-Fahrenheit. It also has nine-inch fan heads, dual copper motors that run non-stop, and reversible airflow to stop the air from being stale. The expandable side panels will appeal too, offering peace of mind that the window range to suit is quite broad. These coupled with the LED indicator lights and adjustable thermostat can be the icing on the cake. Finally, you get all of this for a competitive price tag. This noisy little product is one that will provide a lot of “white noise” in the background, but it will also keep you fresh. You can’t ask for more than that. If your previous window fan has finally died, and you’re looking for a new one to replace it, this one from Air King could fit the bill. You will discover with most fans on the market that they are not how they used to be. They all appear cheaper, not as well made, and not as durable. However, this one will surprise you. It might look cheap, but it certainly doesn’t feel it or act it. It has high-quality materials and parts, features an impact-resistant plastic housing, and has powder-coated steel both on the grill and the blades. Air King has done everything it can to future proof this product. It also operates with one-phase power, 1/6th horsepower, and three speeds. Run it on high, medium, or low, with no problems at all. 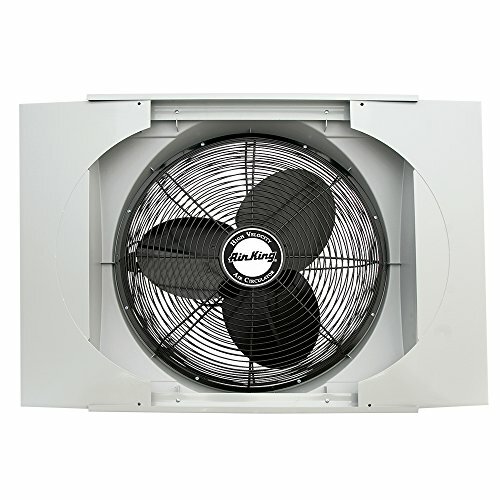 The rotary switch is front mounted for convenience as well, and the window compatibility is broad so this window fan can suit more people. For whole house ventilation, this window fan will impress. It might vibrate and seem a little noisy, but it can move air faster than several other models, with an installation method that will provide minimal frustration. 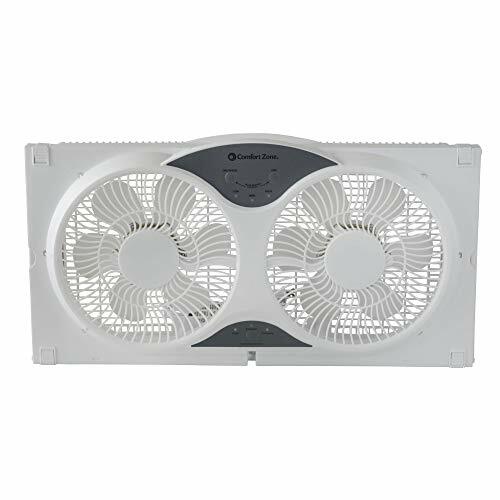 If money is an issue, and you wish to try and get as much value for what you have as possible, then check out this window fan from Optimus. It might not be the best fan for sale, but it’s one of the most affordable. It also offers one of the best balances of value for money. It has three speeds of low, medium, and high, and has an automatic thermostat too. There isn’t too much difference in speeds between the three options, but whatever you choose, you’ll find it to be more than effective given what you paid. 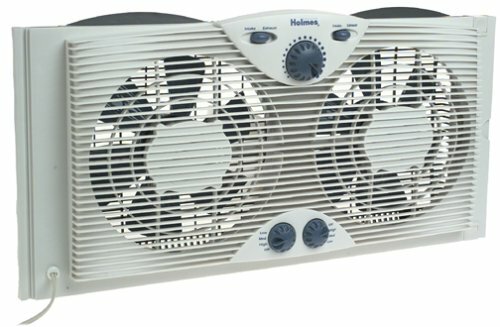 The motor is also rain resistant, while the unit comes with an LED temperature display, reversible airflow, and adjustable slide screens. These features come in handy for when you want to remove stale air, let fresh air in, and ensure a snug fit when you install the fan into your window. This window fan is also suitable for most windows and will prove its worth by how clean your air feels once it gets to work. Many customers say it doesn’t last very long, but if you need a solution for your stuffy home fast, check out this model from Optimus. This twin window fan from Bovado USA is by no means perfect, but once you install it and experience a hot stuffy day, you will find out how valuable it is to have. You can put it in almost any double hung or slider window and experience near-immediate relief. It has three functions, three speeds, and a locking extender panel to keep everything snug and tight. However, some people notice how the panel features inferior materials, and the locking component is flimsy. It also comes with a remote, meaning everything relating to this window fan is electronic. You won’t have to do anything manually, including reversing the fan. The remote doesn’t have a long range, but it saves you having to get up off your seat and go to the unit. 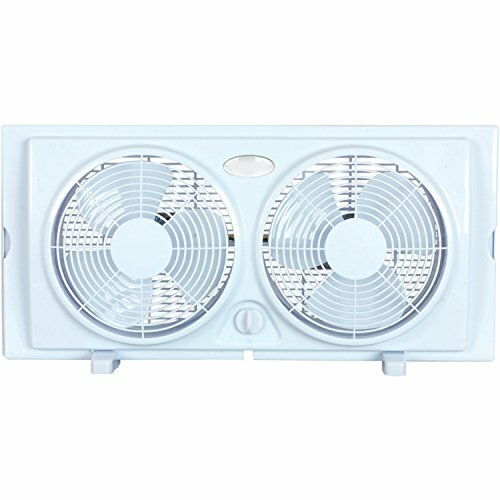 There are also several other features that may have you adding this window fan to your shopping cart. It has a bug net and cover to stop insects getting in, and it lets fresh air in with nine-inch turbo blades. You can set these blades on low, medium, or high. 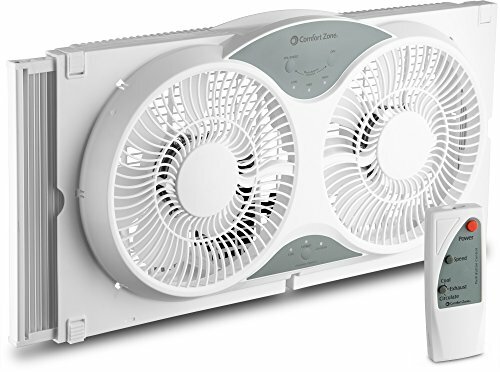 It might be a bit loud to operate and has a few flaws, but if you need an affordable and high-quality window fan, this one is a hot contender. This twin window fan from Holmes is not the most powerful fan on the market, but given its extensive list of features, it won’t matter all that much. 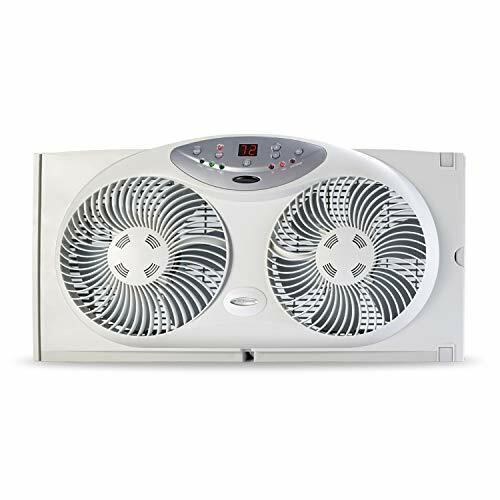 If you find yourself with stuffy, stale air in any part of your home, then this window fan will make quick work of removing it. You can use it in double-hung and slider windows, fitting it securely in place with the help of an adjustable extender screen and additional extender panel. The entire process for putting it in place is also not that difficult, meaning it’s a desirable product for anyone who wants to avoid troublesome installations. That’s not all you can enjoy from this window fan either. Rather than have to make changes manually, this product is automatic. It uses electronic reversible motors to make quick work of alterations you want to make. You can also set it to low, medium, or high. However, the high speed is not as powerful as you may expect or hope – even with dual blades. 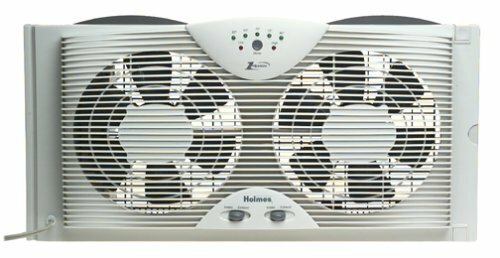 If the time has come to get rid of that stuffy, stagnant air, then you can do a lot worse than this window fan from Holmes. It’s an affordable, easy-to-install, and stylish fan that’s suitable for almost any home. If you want a no-frills approach to home cooling, then check out this window fan model from HowPlumb. It’s the epitome of basic, which may end up suiting people who don’t want to waste time with unnecessary features. It comes with two speed control dials instead of the standard three, and has auto-lock accordion expanders to keep it firmly in place. Once you install it in your windows, it will look like it belongs there. It will also suit windows with dimensions between 22.5 and 33 inches. If you would prefer your new window fan didn’t become a portal for bugs, then the addition of the fabric cover will be a welcome feature. What’s more, if you’re installing it near a tabletop, it comes with removable legs so you can place it on a surface. The built-in handle will end up being quite convenient for transport too. If you want to exhaust stale air out the window, then the manual reversing feature comes in handy. Most window fans will do this automatically, but the manual approach offers full control. If you prefer fans that do all the hard work for you, then this is not the unit for you. However, if you prefer basic appliances you can understand, there’s every reason to consider buying this one from HowPlumb. When price doesn’t so much matter as long as your window fan gets the job done, then check out this fan from Lasko. Even though it costs far more than several other models on the market, you won’t mind if it operates at its best. The jury is still out on whether it does to the best of its ability. It comes with all the right features you would expect of a fan of this caliber – the storm guard, electronic reversing, and expandable side panels. It even comes with three speeds for both exhaust and intake. It’s sleek, effortless to install, and will provide full-house ventilation when you need it the most. However, it has equally as many problems as it does features, at least for some consumers. Not even the broad compatibility and full assembly upon arrival can rectify that for some people. It doesn’t appear to be well-balanced in the internal components, and shows this by vibrating at high speeds. To solve the problem, you often have to run it at low speeds – thus not doing the job you bought it to do. It’s also loud which can be a problem when you’re using it for full house ventilation. These problems are easy enough to fix by the manufacturer, but they can be a deal-breaker for a consumer looking for a straightforward window fan to freshen up their premises. Even though this window fan from Lasko is not as powerful as other models on the market, it’s still a unit you would consider buying for several reasons. It’s not going to win awards for durability or longevity, but there are many reasons why people continue to buy it. It features robust plastic casing, it’s made here in the USA, and it has powerful eight-inch blades with an electric reversing option. With two speeds from which to choose, you also get peace of mind that it will refresh the air as and when you require it. The independent motor control, intake and exhaust capabilities, and generous window compatibility will also appeal. This window fan will be suitable for several different windows with minimal installation hassles. It uses E-Z Click expander panels to keep it firmly in place, operates on two fans, and has an adjustable thermostat as well. If you find yourself in need of somewhere to sit this fan, not relying on the window itself, then the legs come in handy here too. They are snap-on legs you can remove as quickly as you can install them. It has no privacy screen which can be an issue if you have nosy neighbors, but aside from that and its lack of power, it’s still a valid and affordable option for many people. Some people may have problems with the longevity and noise of this window fan, but if you have a budget and want to stick with it, read on. For minimal investment, you can have an effective window fan that does what you need it to do, and more. It will take in air and release it, has two rotary switches, and operates seamlessly with its nine-inch blades. If you have stale air, this window fan takes care of that too. It will exhaust and intake air when you need it. It’s also straightforward to install, suits most windows, and will use both fans to keep the air circulating. It’s a noisy fan, there’s no denying that, and it might not last as long as you require, but it can be the perfect addition to your home if you don’t mind having to replace it sooner than you expect. The market is full of window fans for sale – all that are competing for their share of the market. Marketing and advertising ploys can then make it challenging for you to find a fan that suits your needs the best. If you’re having trouble, consider these points. If you are getting an expert to install your new window fan, then how easy that process is isn’t going to affect you. However, if you plan on being the handy person in your household, then it pays to read the comments. Find out how straightforward it is, whether it will fit the dimensions of your window, and how the panelling works too. Paying attention to this information can make the difference between a fan that fits and one that doesn’t. 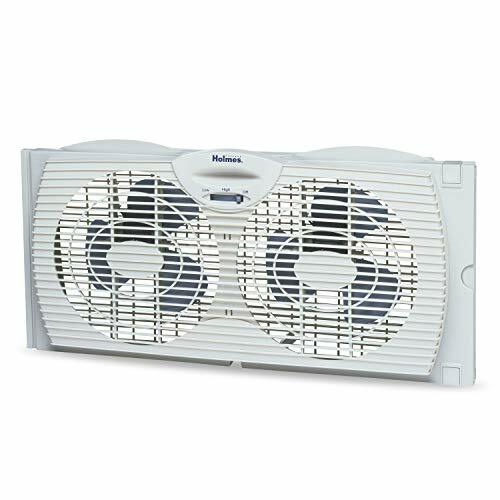 Most window fans come with three speeds – high, medium, and low. However, that’s not to say they all do. Some come with two, while others have six – three for intake and three for exhaust. Identify this information to see if it has all the speeds you require for your home. The functions and features for each fan will differ. Some are automatic and electric, while others require full manual setting changes. It helps to read the instructions and features of a product before you buy it. You can then be sure you bought the right one. Some window fans operate with one fan, while others have two. Consider how much air you want to shift at once. Most homes will require two fans.